MM: I guess the best place to start is at the beginning and with that in mind, would you like to introduce, and tell us a little about, yourselves? NXS: Hello, my name is Nick Sharps or N.X. Sharps in the published world. I’m an editor, author, and most importantly a kaiju enthusiast. 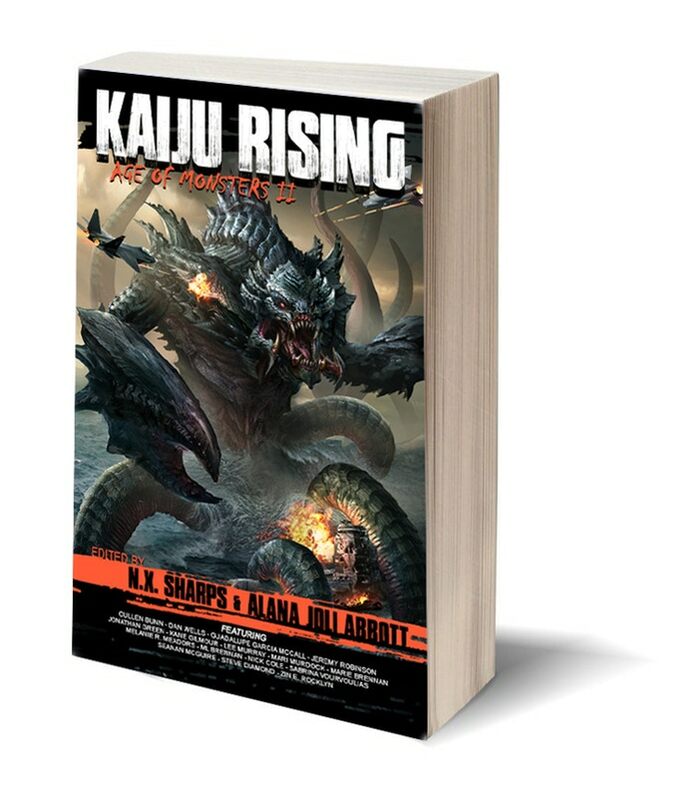 I am the project creator and co-editor of both Kaiju Rising: Age of Monsters and Kaiju Rising II. I was also the project creator of MECH: Age of Steel. I’ve also written fiction that has appeared in such anthologies as Manifesto: UF, That Hoodoo, Voodoo That You Do: A Dark Rituals Anthology, SNAFU: Hunters, SNAFU: Black Ops, and I co-wrote the novella From The Ice They Came with Eric S. Brown. AJA: And I’m Alana Joli Abbott, the Editor in Chief at Outland Entertainment, as well as a writer and game designer. I’ve got three fantasy novels under my belt (my first is Into the Reach), I write interactive novel apps for Choice of Games (the most recent is Choice of the Pirate), and I’m the editor on Outland projects like Warlock 5, Nightfell, and Shotguns & Sorcery. This is my first anthology gig, and I’m excited to be working with Nick on it! AJA: I have to admit, until I came on board with this project, I was one of those rock dwellers! I had heard the term (thank you Pacific Rim) but I didn’t really know the history behind the whole big monster genre—and it’s a really cool one! The whole film genre came about because a Japanese filmmaker combined the huge successes of Hollywood movies like King Kong with the 1950s fear of the havoc humanity was capable creating with atomic weaponry and energy. (I wrote more about that over here.) The word comes from “strange beast,” but it typically refers to huge monsters that attack (or sometimes defend) major cities. Some have a fantastic flare, but they’re often the biproduct of what goes wrong when humans muck about with science and impact something old. And any time there’s a kaiju, you know you’re in for some good ol’ stompy, smashing destruction. MM: When, where and why did your fascination with monsters begin? What is it, in your opinion, about monsters (and particular Kaiju) that fascinates people and inspires such rabid devotion in monster fandom? NXS: My fascination with monsters goes way back to my childhood. My mom dated a guy that had all these bootleg monster movies on VHS – everything from Creature from the Black Lagoon to Monster Squad. But my favourite of all was his Godzilla collection. I was too young to understand much of the plot but I believe watching Godzilla in all his glory is a universal joy. I didn’t give giant monsters much more thought until the release of Cloverfield back in high school and then again until Pacific Rim in 2013. That’s when it really stuck, and a few months after Pacific Rim‘s debut we launched the first Kaiju Rising anthology. I think kaiju inspire such dedication because they can represent everything from power fantasies to the physical embodiment of our varied fears. There’s no shortage of thematic diversity when it comes to kaiju, and I believe that’s something both Kaiju Rising and Kaiju Rising II succeed at demonstrating. MM: Okay, let’s talk about Age of Monsters II… Why did you choose to follow a crowdfunding path instead the more traditional publisher / publishing house avenue? What do you think are the benefits of crowdfunding and what, if any are the drawbacks? AJA: Outland Publications is the new wing of Outland Entertainment, an indie game, comics, and fiction publisher, as well as a creative services house. One of the things that’s becoming truer in indie publishing is that getting the audience on board through crowd funding is a really powerful way to create and make successful projects. That’s been true for fiction anthologies as well. The first Kaiju Rising book and its companion volume, MECH, were both successfully funded on Kickstarter. I feel like Kickstarter is a platform that allows patrons to feel invested in a project, and to know that they’re contributing to its success—besides getting in on some cool extras! MM: Tell us about the backer rewards and incentives….? NXS: For this Kickstarter we wanted to keep things streamlined. This project is all about the book, so we decided simplicity was the best policy with rewards and incentives. 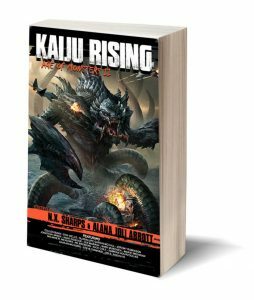 We’ve got eBooks, softcovers, and Kickstarter exclusive hardcovers (featuring limited edition slipcases) available for both Kaiju Rising and Kaiju Rising II. Almost all of the authors on the line-up also offered Tuckerization/Redshirting options for their stories, so that diehard fans could be injected into the fiction of their favourite authors. Furthermore we have interior art stretch goals, with seven pieces of interior art at $16,000 and another seven pieces of interior art at $17,000 funding. MM: How does Age of Monsters II differ from Kaiju Rising, the first volume? Obviously there’s a similar continuation of theme, but what separates it from, and liberates it from under, its predecessors shadow? NXS: I’d say the biggest difference between Kaiju Rising and Kaiju Rising II is that the sequel is a little tighter, a little more focused. As anyone who has read the first anthology can tell you, there is a lot of genre-diversity on display in Kaiju Rising. It’s got horror, comedy, thriller, science fiction, fantasy, alternative history, cyberpunk…each author told a unique tale. We love that about the first anthology and we don’t want to lose that with the sequel. With Kaiju Rising II however, we requested more action-orientated stories. We still want Kaiju Rising II to offer a cross section of genre fiction but also wanted to appeal to that crowd who is going to go see Pacific Rim: Uprising and Godzilla vs. King Kong and crave more thrilling monster action. 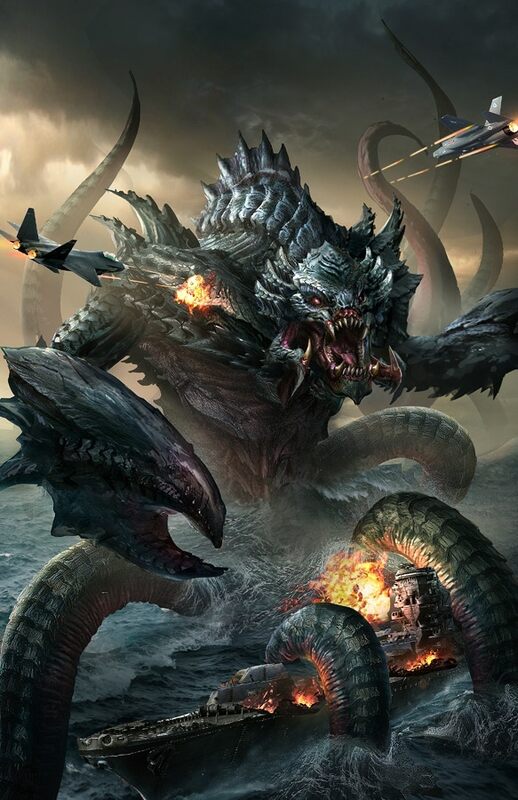 MM: And what kind of monster thrills and Kaiju chills can readers expect from, and to find in, Age of Monsters II? NXS: So here’s a sample of what you can expect from Kaiju Rising II…we’ve got a story featuring giant ravenous coral monsters rampaging in a post-apocalyptic Water World-type setting. We’ve got a planetary surveyor doing the whole Naked and Afraid survival thing on a bioluminescent planet where glowing rain attracts predators. There’s a Lovecraftian-influenced descent to investigate an anomaly at the bottom of the Mariana Trench. There’s a giant lizard vs. giant eagle vs. giant turtle territorial dispute that causes Hurricane Irene. AJA: We’ve also got a kaiju-sized take on the Jersey Devil legend, a sea creature who is cared for by New Yorkers struggling with changes are their neighbourhood is gentrified, and wickedly eerie creatures destroying a Mexican ranch. NXS: And one last little teaser for you…we’ve got a modern-day Spartan hunting a colossal city killer through a post-apocalyptic wasteland. MM: What can you tell us about the authors involved in, and who have contributed stories to, the book? AJA: I’m really thrilled to have such a great group of authors working on this book. Jeremy Robinson, whose kaiju novel Project Nemesis is huge (no pun intended), and Kane Gilmour (The Crypt of Dracula) are both return authors from Kaiju Rising. You’ll recognize fantasy and urban fantasy bestsellers Seanan McGuire and Marie Brennan; literary award winners Lee Murray, Sabrina Vourvoulias, and Guadalupe Garcia McCall; game writer Mari Murdock; well-known novelists ML Brennan, Nick Cole, Steve Diamond, Jonathan Green, Dan Wells; comics creator Cullen Bunn of Warlock 5; and frequent short story contributors Melanie Meadors and Zin E. Rocklyn. Each of them brings something different to their story, and I think those different styles and starting points are part of what makes this such a strong collection. MM: How did you go about sourcing the tales for it? Did you approach the authors or did they approach you? How did it work? AJA: We invited all our contributors for the anthology. Nick started the project with a pretty good idea of who he wanted on board, and he, along with one of our mutual colleagues Alan Bahr who helped us get the project started, pulled most of the author list together. As I came in to the process, I saw room for some different voices that would really compliment the list and brought on the last several. Then one of our writers, Melanie Meadors, brought Seanan McGuire along for the ride after the Kickstarter started, and we’re glad to have her! MM: Obviously Age of Monsters II is a labour of love for you, but what can you tell us about the process of putting the book together? AJA: The most key part of the process is, of course, the stories! The writers have done a fantastic job working with us to create their best possible pieces. Nick is a really excellent big-picture storyteller and has a great sense for what works and what needs to be changed, while I’m more of the nit-picky editor, so we’ve divided up the tasks to our strengths. Nick has done most of the first-pass work with our stories, and then I go over them with a fine-toothed comb. We were able to get some fantastic cover art from Tan Ho Sim, and our publisher, Jeremy Mohler, put together the awesome design work. MM: What’s you definitive, all-time favourite Kaiju movie or story? And why is it your number one monster stop? What makes it special? NXS: So this is likely to be an unpopular opinion, but I love Cloverfield. I’m a sucker for both kaiju and found footage flicks so combining the two is an instant win in my book. I find the human drama and perilous trek through a city besieged by a partially-glimpsed monster extremely engaging. I appreciate that no questions are really answered. I love the mystery of it all. I also just adore the Cloverfield monster. Outside of cinema though I have to say my favourite kaiju stories can be found in Kaiju Rising. I know that’s biased but it’s also true. I mean, I got to select a bunch of my favourite authors to write stories about giant monsters – how could I not love that? If I have to narrow down my favourite stories from the first anthology (no easy task) I’d have to say it’s a toss-up between James Lovegrove’s “Big Ben and the End of the Pier Show”, C.L. Werner’s “Animikii vs. Mishipesju”, and Natania Barron’s “Occupied,” but honestly they’re all great. 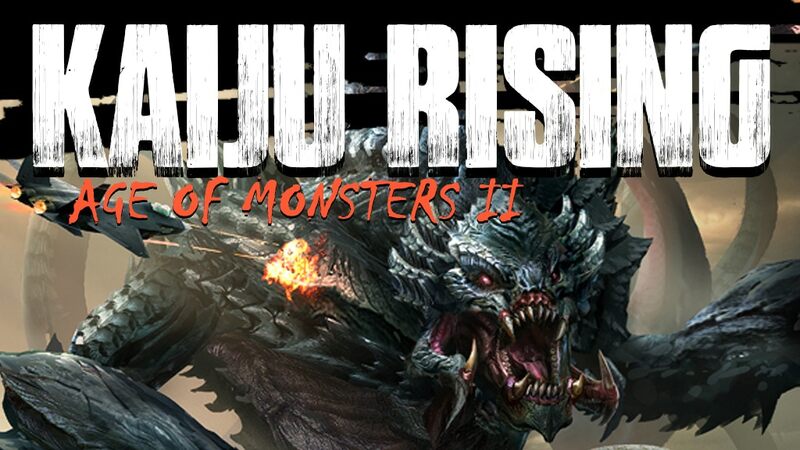 As for Kaiju Rising II…you’ll have to wait to find out. AJA: To tell the truth, I think my favourite piece is in the new anthology! I was floored to read a kaiju story that was so touching at the end I had tears in my eyes. You’ll have to read the anthology to figure out which one it is! MM: How can monster fans back the book? And if there’s anything that you’d like to add, now would be the time to do it before Godzilla flattens Tokyo**…. NXS: Fans of giant monsters or just quality genre fiction can back Kaiju Rising: Age of Monsters II by following this link: https://www.kickstarter.com/projects/1330509990/kaiju-rising-age-of-monsters-ii-a-giant-sized-anth/posts/2097671. If you don’t have the funds to pledge to the campaign that’s also cool, please just spread the word on Facebook, Twitter, or at your local monster emergency bunker. Any help you can provide in getting the word out is extremely appreciated. Lastly I’d just like to add how thankful we are for all of our backers, supporters, and authors. We are extremely passionate about this project and truly appreciate everything done to bring this monster to life. *Yes you do. You know you do. If you didn’t, you wouldn’t have read this interview. **Which he’s given to doing at regular intervals.